Nefertiti was the wife of the Pharaoh Akhenaten of the 18th Dynasty of Egypt. Her name means, `the beautiful one has come’ and, because of the world-famous bust created by the sculptor Thutmose (discovered in 1912 CE), she is the most recognizable queen of ancient Egypt. She grew up in the royal palace at Thebes, probably the daughter of the vizier to Amenhotep III, a man named Ay, and was engaged to his son, Amenhotep IV, around the age of eleven. 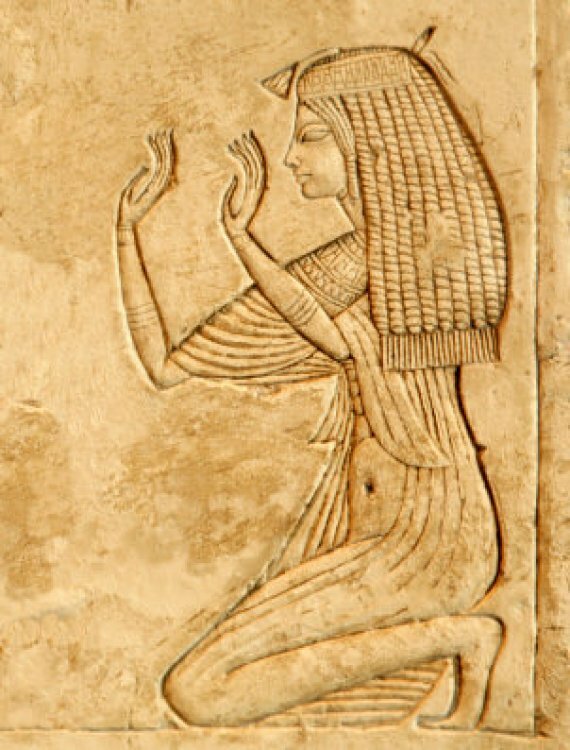 There is evidence to suggest that she was an adherent of the cult of Aten, a sun deity, at an early age and that she may have influenced Amenhotep IV’s later decision to abandon the worship of the gods of Egypt in favor of a monotheism centered on Aten. After he changed his name to Akhenaten and assumed the throne of Egypt, Nefertiti ruled with him until his death after which she disappears from the historical record. 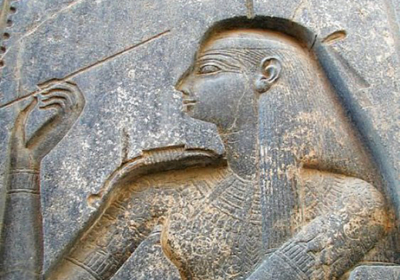 She ruled alongside Akhenaten during the eighteenth dynasty (1550-1292 BC). She lived in Tell El Amarna, a city constructed by the pharaoh to worship their god Aten. There, they safeguarded their family and their beliefs—it became the center of Egypt’s new religion. 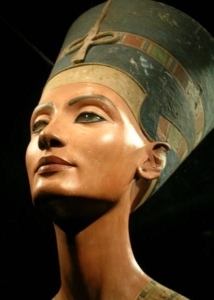 It’s believed that Nefertiti was probably a distant relative to Akhenaten and a favorite queen to the pharaoh. Nothing is known about the queen’s childhood and no evidence has yielded who her parents are. Some believe her father could be Aye due to inscriptions found inside his tomb proclaiming him the father of her sister Mutnodjmet. During her reign as queen, Egypt went about many radical religious changes. Hundreds of years of culture and worship had been exchanged for a new radical concept— Monotheism. The old gods had been disregarded, temples shut down, and priests forced to change their ways. Many historians believe this transition could have been hostile and was not adopted so easily by the citizens or priests. Her reign with Akhenaten was unlike the traditional ways Egypt had seen. She was more than just a typical queen and helped to promote Akhenaten’s views. Her reign was only 12 years, but she was perhaps one of the most powerful queens to ever rule. Supporting her husbands’ beliefs she changed her name to Neferneferuaten-Nefertiti meaning, “The Aten is radiant of radiance [because] the beautiful one has come.” Her importance was greatly valued by Akhenaten and he went to great lengths to show her as his counterpart. 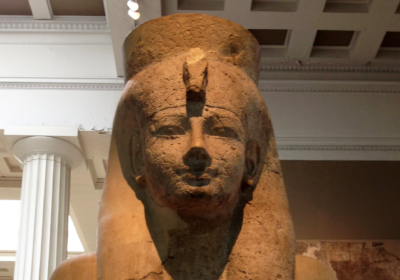 As queen, she took on powerful roles and showed herself in ways only Egyptian kings did. For example, she was often shown with the crown of a pharaoh or was depicted in scenes of battle smiting her enemies. Akhenaten valued her so much, that he also allowed her to practice that art of priesthood and she too was allowed to make offerings to Aten. Many Egyptologists believe that perhaps Akhenaten was born with deformities that hindered his role as king. One of the ailments that were believed he had was bad vision. This illness could have made his job difficult, in turn, he could have put trust into Nefertiti allowing her to decide many important matters. He trusted her so much, that he went as far as placing her name next to his in his royal cartouche. This was very unique and could have symbolized her as equal status next to Akhenaten. Other depictions show the couple side by side often with their children in a utopic fashion. In one stela, found in Tell el Amarna, the couple is seated together. 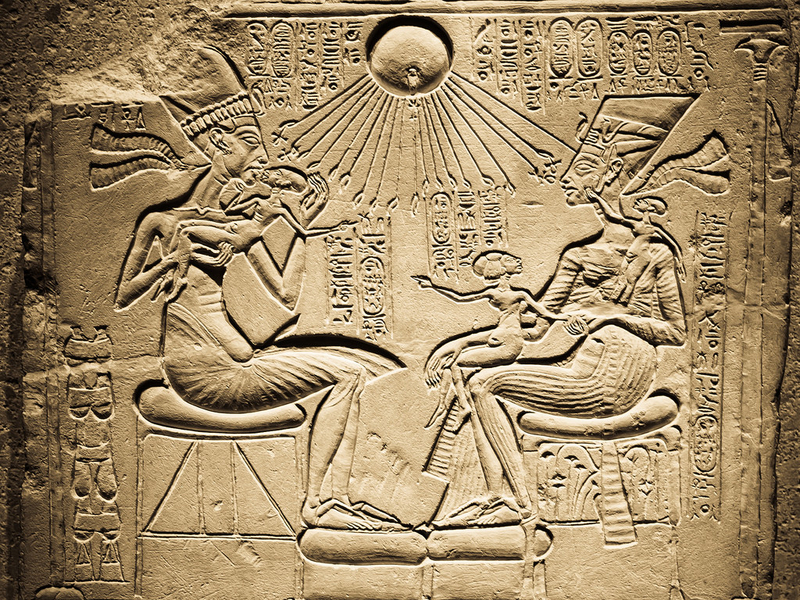 Akhenaten is giving his daughter an earring while his wife Nefertiti has the other two daughters on her lap. In this depiction, the queen is having a wonderful time and is shown in a loving manner with her husband and children. Both are shown as equal counterparts in their status and family affairs. Even though it appears that Nefertiti was the daughter of Ay, this claim is far from substantiated. Inscriptions refer to Ay’s wife, Tiye (or Tey) as Nefertiti’s wet nurse, not her mother, and nothing is known of Ay’s lesser wife. Ay, in addition to his other duties, was tutor to the young Amenhotep IV and may have introduced the prince to Nefertiti when both were children. Nefertiti and her sister, Mudnodjame, were certainly regular members of the court at Thebes and, whether or not Ay introduced her to Amenhotep IV, the two would have known each other simply for that reason. Ancient images and inscriptions indicate her early interest in the cult of Aten but, as every Egyptian favored one god or another, there is no reason to believe that she had any ideas relating to monotheism or elevating Aten above the other gods (as has been suggested by some scholars). All that can be stated with certainty is that both sisters were adherents of Aten and may have influenced Amenhotep IV’s interest in that cult from an early age. Any definitive statements regarding her influence on the rise of monotheism in Egypt must of necessity be speculative as there is no conclusive evidence to support it; just as there is little information on her life in general. By the time she was fifteen years old she was married to Amenhotep IV and, after the death of Amenhotep III, she became queen of Egypt. 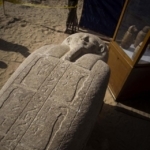 It is at this stage that some scholars claim she most exerted her influence on Amenhotep IV to abandon the ancient religion of Egypt and initiate his religious reforms but, again, this is unsubstantiated. In the fifth year of his reign (some sources claim the ninth), Amenhotep IV changed his name to Akhenaten, abolished the religious practices of Egypt, closed the temples, and decreed Aten the one true god. While it is possible he created monotheism out of a genuine religious conviction, it is more probable that it was a political manoeuver to cut the power and wealth of the priests of the god Amun, whose cult was extremely popular. Throughout the 18th dynasty the cult of Amun had increasingly grown in wealth and prestige so that, by Akhenaten’s time, the cult’s priests were almost as powerful as pharaoh. Instituting monotheism, and proscribing the old religion, would have completely restored power to the throne; and that is precisely what it did. The god Aten was now considered not only a powerful god of Egypt but the god of creation, the one true god of the universe. At the site of Akhetaten (Amarna), the new city dedicated to the god Aten. In the sixth year [of Akhenaten’s reign] Nefertiti’s name was changed to Nefernefruaten which means `Beautiful in beauty is Aten’. Nefertiti lived with Akhenaten in Amarna where he conducted religious services to Aten. (Bunson, 185). The royal family originally lived at the palace of Malkata in Thebes, which was built under the reign of Amenhotep III but renovated under Akhenaten and re-named Tehen Aten (meaning `the splendor of Aten). Watterson, and others, also point out that the palace was abundant in gold decorations and ornate reliefs. 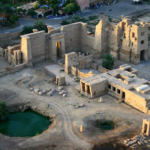 However opulent Malkata was, the new palace at the city the couple founded, Akhetaten, was even grander and, more importantly, served a symbolic purpose in the new religion of Aten. As part of his religious revolution, Akhenaten decided to leave Thebes and move to a virgin site that would be dedicated to his new cult. The new city was located in Middle Egypt, and called Akhetaten, `Horizon of Aten’. It was laid out parallel to the river, its boundaries marked by stelae carved into the cliffs ringing the site. The king himself took responsibility for its cosmologically significant master plan. In the center of his city, the king built a formal reception palace, where he could meet officials and foreign dignitaries. The palaces in which he and his family lived were to the north, and a road led from the royal dwelling to the reception palace. Each day, Akhenaten and Nefertiti processed in their chariots from one end of the city to the other, mirroring the journey of the sun across the sky. In this, as in many other aspects of their lives that have come to us through art and texts, Akhenaten and Nefertiti were seen, or at least saw themselves, as deities in their own right. It was only through them that the Aten could be worshipped: they were both priests and gods. -Egyptologist Zahi Hawass explains. In her role as part of the divine couple, Nefertiti may also have been co-regent. Akhenaten joined his cartouche (his seal) with hers as a sign of equality and there is evidence that she took on the traditional duties of pharaoh while her husband busied himself with theological reformation and architectural renovations. Images which have survived depict her officiating at religious services, receiving foreign dignitaries, moderating diplomatic meetings, and even in the traditional royal role of the king smiting the enemies of Egypt. None of these images would have been created if there were not some truth behind the stories they depict and so Nefertiti must have wielded more power than any woman in Egypt since the time of Hatshepsut (1479-1458 BCE). From the royal palace at Akhetaten, she sent forth the royal decrees and made the decisions which, according to tradition, were the responsibility of her husband.